congas, timbales and drumset with the legendary Cuban percussionist, “Changuito”. Changuito with special guest Walfredo Reyes Sr.
and The Cuban Martinez Show. Please call (514) 482-5554 or contact [email protected] for more information. 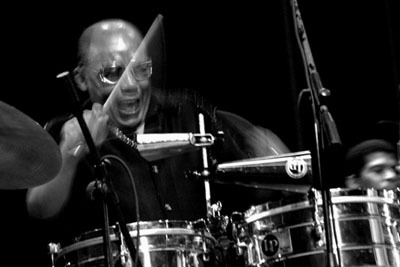 Jose Luis Quintana “Changuito”, the man credited with revolutionizing Cuba’s popular “songo” rhythm, is one of the most imitated percussionists in the history of Cuban percussion, and he lists as students Giovanni Hidalgo, Luis Conte, Carol Steele, Karl Perazzo, to name a few. Changuito was born in Casablanca, across the bay from Havana on 18th January 1948. He embarked upon his musical career in 1956 at the tender age of eight, becoming a professional musician with the ‘Habana Jazz’ band directed by Tomas Gonzalez. At 11, he became part of “Conjunto Cubamambo” and a year later was regularly appearing at “Moroco Night Club” in La Habana. He worked for several years with different bands like “Orquesta Show”, “Los Armonicos”, and “Sonorama Seis,” and traveled Cuba from one province to the other. In 1970, he returned to La Habana and joined Cuban dance band “Los Van Van”. They soon became one of the most popular Cuban orchestras in the world, achieving international recognition and fame. With them, Changuito inaugurated the ‘songo’, where the original combination of percussion instruments (timbales, cowbells, woodblocks, electronic drums and cymbals) and the technical displacement of hands sealed a distinctive and highly original touch. Definitely, his groundbreaking work with Van Van defined an entire era of Cuban music. He stayed there for nearly twenty-three years and recorded many albums. Pedrito Calvo, a lead singer for Los Van Van, consecrated Changuito when he screamed in “Sandunguera”, “Chango, el misterioso, rompe la paila! “ (“Chango, the mysterious, break the timbale!). That was a big step in Changuito’s career making him a true popular musician in the salsa music world. In 1992, Changuito made his first solo appearance and started to teach percussion to students all over the world. 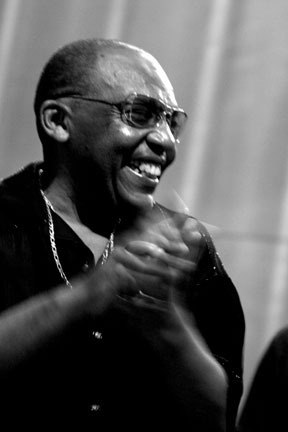 Throughout the years, he had visited many important places across the United States, Europe and Latin America, like Modern Music School of New York, Berkley College, San Francisco House of Culture, Universal Hall of Los Angeles, Druman Cole of New York, Amsterdam Conservatory, Universidad Escuela de Musica de Puerto Rico, and Escuela de Musica Moderna de Chile, among others. Changuito has been nominated to multiple international awards as well as he has toured Europe and United States with different orchestras during the last decade. Warner Brothers Publications edited many educational videos and a book for beginner percussionists in which this Cuban master conga and timbale player demonstrates part of what is being his legacy to the music world. His first solo album “Syncopation” was record in 2001, produced by Tony Thorpe. In 2005, when visited Venezuela for attending the International Afroamerican Traditions Festival, he was approach to record his latest album, “Telegrafia Sin Hilo” (“Wireless Telegraphy”) produced by famous Cuban producer Luis “Papo” Marquez. This album was released in Venezuela in November 2006 and it’s expected to be released in US and Europe by the end of 2007. Changuito is considered today as one of the most influent and greatest percussionist of the world. Many critics as well as many artists believe that Changuito’s performance is just unbelievable and inimitable.